Sometimes, the worst thing about Christmas is getting there! Once it arrives, it’s lots of fun–so don’t have an accident on the way! That drive over the river and through the woods brings its own hazards. Be aware that you may be more likely to have an accident at this time of the year. This is easily the busiest time of year, but it’s important to make time for safety while celebrating the holidays. By committing a few minutes each day to safety, many auto injuries can be avoided and your holidays will be memorable for all the right reasons. Minnesota has no shortage of bad weather this time of year. Unfortunately, bad weather means an increase in automobile accidents. 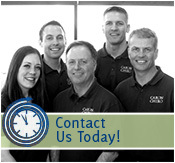 If you have been involved in a car accident, any injuries need to be taken very seriously. Soft tissue injuries are injuries to the connective tissues surrounding the spine – the muscles, tendons and ligaments. In an accident, these soft tissues can be stretched and torn, causing symptoms that can be as minor as a simple sprain that clears up in a day or two, or a permanent injury. In most neck, back and spinal cord injury cases, the injury occurs because of rapid change in speed of the head and torso in an auto accident. These change-in-speed cases are called acceleration/deceleration injuries. This is why many people refer to neck and back injuries as “whiplash” injuries. Because symptoms of a whiplash injury can take weeks or months to manifest, it is easy to be fooled into thinking that you are not as injured as you really are. If you have been involved in a car accident or any other kind of accident, don’t assume that you escaped injury if you are not currently in pain. Too often people don’t seek treatment following a car accident because they don’t feel hurt. Unfortunately, by the time more serious complications develop, some of the damage from the injury may have become permanent. Minnesota people that are injured in a car accident are protected by what’s called Minnesota no-fault insurance. This means that anyone injured in a car accident can get the treatment that they need with absolutely no cost out of their pocket. It doesn’t matter if you were the driver or passenger. It doesn’t even matter if the accident was your fault or not. You can see any chiropractor without a referral. If you are injured in a car accident, your Minnesota auto insurance pays up to $20,000 in medical expenses. If the other drive is uninsured you still have medical coverage. 93% of people suffering from whiplash improve with chiropractic treatments. About 75% of injuries form car accidents occur at speeds below 12mph. Even though the holidays are a time for family gatherings, the busy holiday season can contribute to a lack of attention being paid to safety. The last place your group wants to get together is the emergency room. In spite of your best efforts, accidents can and do happen! If you have been involved in a car accident, you need a doctor who specializes in the treatment for whiplash and other auto accident injuries. Even if you are just sore, you should get checked out immediately because you may experience serious health problems many months down the road. This entry was posted	on Sunday, December 23rd, 2012 at 6:00 am	and is filed under Auto Injuries, Back Pain, Chiropractic Treatments, Neck Pain. You can follow any responses to this entry through the RSS 2.0 feed. You can leave a response, or trackback from your own site.